The best job postings are structured, informative and content-rich. Your hero media (video/image) should be “above the fold” (like in a magazine or newspaper article). This helps your job posting to get the attention of the candidate and make an optimal first impression. Avoid slang and/or abbreviations, use plain english. Aim for 2 to 3 words or 20 characters or less. Try to never go beyond 60 characters as Google doesn’t like that for SEO. Your primary call-to-action should be “apply”. You want your apply button to standout. Make the button color and font color impossible to miss. Secondary calls-to-action include “join talent community” or another opt-in to try and capture the candidate’s email address so you can send them job alerts. Utilize bulleted lists, but make sure they’re formatted correctly. Should be an authentic statement from the heart of the company. The main questions you want to answer: Why should candidates want to work for your company? What makes you different from other companies? Keeps them on your job page and not wandering off to other websites. Gives you extra opportunities for employer branding on your job postings. Consider a 2-column format (like the template pictured below) for the best readability (that’s why newspaper and magazine articles are in columned format). Ongig’s mission is to give you the best job postings in the world. To do so means you need to use the best job posting template ( like above). 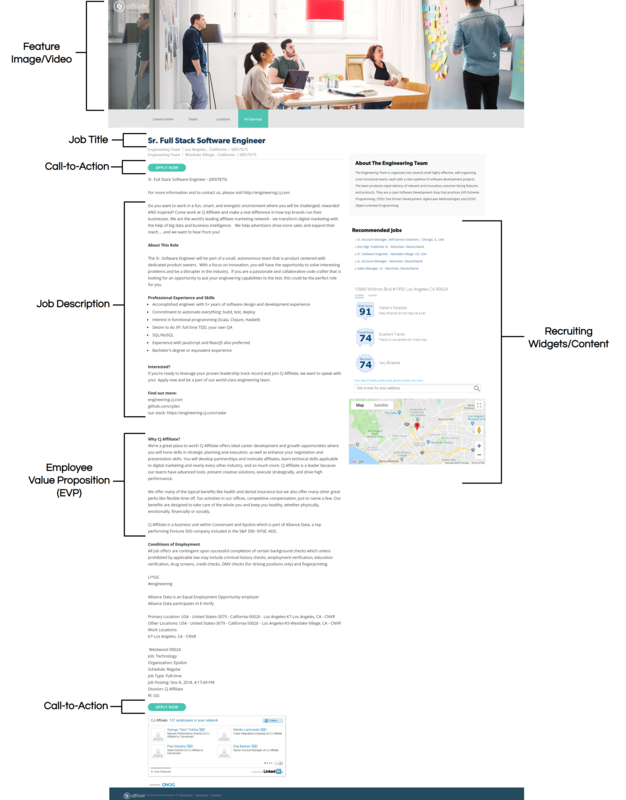 Ongig’s job description software lays this template out for you. Please ping us if you’d like to learn more. Or, if you’re doing it yourself, we hope this helped!